0 Comments Published by KL Ocs Kid on Wednesday, August 15, 2007 at 4:02 PM. Jamie Carragher goes into Liverpool's latest European campaign having re-iterated to Steve McClaren that he does not want to be play for England again. McClaren made a personal visit to Liverpool's training ground on Monday to meet Carragher but the Reds defender politely declined the England coach's request to change his mind. Reds boss Rafael Benitez said: "I was aware that Steve McClaren has spoken to Carra again, and I was not made aware of the outcome but it is something for the player to decide. "In such situations, you always have to support your player and respect his decision. He is a great player and has never let his country down, but if this now means that I can use him more for Liverpool then I am obviously pleased." 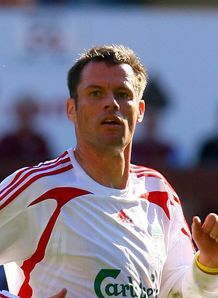 Carragher will be part of a Liverpool defence trying to ensure a safe passage into the group stages of the Champions League. Toulouse, who beat French champions Lyon on Saturday, believe they can produce an upset in what are expected to be extremely warm conditions. But Liverpool are expected to successfully negotiate this third-round qualifier, with Benitez insisting: "We will try to solve the problem here but, if not, we always have Anfield waiting for us."